Water pumps for RVs are absolutely a must-own if you need all your appliances and bath fixtures to work. Water pumps make it possible for you to enjoy running water from your sink, flush waste from your toilet and more. If you have a water supply in your RV, you won’t be able to get your water when you need it until you have a working water pump installed. In this review, we will be taking a look at five great water pumps for RVs, from companies such as Arterra, Shurflo and Bayite. We will go over each of their strengths and weaknesses, and declare which is the water pump that you should go after. Is quiet and rumbles gently. Is safe to run dry. Has a soft start feature. This first water pump for RVs is the Shurflo Revolution. This is a serviceable pump that can work with toilets, sinks, showers and other fixtures at up to 55 PSI. This water pump draws 7.5 amps from a 12 VDC power bank. It takes after an eco friendly design and construction so that not a lot of power is needed or toxins are created as a result of this pump being in use. It has a nice, small shape that makes it suitable to be installed anywhere you need it to in your RV. This pump utilizes Shurflo’s patented “flow reactor technology”, which helps the pump reduce noise, reduce vibration and prevents it from working itself out. This is sure to add years to the pump’s life. There is no need to worry about any dry periods, as this pump can run dry without anything going wrong. There is also thermal overload protection with this water pump, meaning that if this pump overheats, it will automatically shut off before anything can go wrong with it. This water pump also includes a 2-year warranty. If the water pump goes bad on your first few days of use, there might be a problem that could be a manufacturer error, in which case, you could get it replaced at no cost to you. The thermal protection feature is very useful, but people who aren’t aware of this feature might instead think that this water pump just stops working, which isn’t the case. Either way, this can lead to scares and inconveniences that test the RV owner’s patience. Thermal shut-off can be deceiving. Bayite brings us this economical, diaphragm water pump. It is a small water pump, but it packs a punch with 80 PSI. It can be used for the RV, boats, garden sprinklers, the shower at home, and more. This water pump can self-prime with up to seven feet of suction lift. There is no need to worry about gravity trapping water in your pipe work, as this pump should do a decent job getting your clean, fresh water to all of your utilities. This water pump comes with a one-year warranty, and a money-back guarantee. If you aren’t happy with your purchase, you can decide to get a full refund within one year. Even if you opt to get your Bayite water pump replaced with another copy of it, you can opt to get your money back when all is said and done. This is a very cheap water pump that will pump water at an acceptable rate. This pump is also more easier to connect than most water pumps, without doing much professional work. This is a very affordable water pump, but it is arguably the loudest pump in this review. The noise can be compared to that of a vacuum cleaner, in which you may not be able to have a sound conversation with another person. Not a pleasant experience when you want to cook, shower or relieve yourself. This next water pump comes from Flojet, a name that is greatly known for bilge pumps and other aquatic devices. This water pump in particular is a budget-friendly pump that can product water at 50 PSI, ideally for older models of RVs. This water pump from Flojet is made of corrosion-proof materials. If you happen to get something toxic or acidic in your water, it will not dissolve anything inside the pump, which is great to know. It can self-prime with up to nine feet of suction lift, which means no water will be trapped in a certain area of your pipework due to gravity. No need to worry about vertical pipes that pass water upwards not working. The small, portable nature of this water pump makes it a versatile pump to install no matter where the proper location is in your RV. It can fit in tight areas and cooperates with your water admirably. The mount and the built in bypass help absorb noise, making this a very quiet and very calm water pump overall. Without the mounts, this pump will rattle, and it can effect the long-term life of the product as a whole. This is another dry-running water pump that will not go bad if it runs with no water. The magnetic motor makes it so that very minimal wear and tear, if any, occurs after every use. This is a very affordable water pump that fits within any RV owners budget. It is a good water pump for owners who don’t want to spend too much, so there won’t be much concern over getting a pump that is too cheap. The PSI claims to be 50, but from our findings, that number dips every now and then. Weak water pressure results in not enough water for flushing, cleaning and showering, and many RV owners prefer a moderate flow of water all the time, every time. PSI sometimes drops less than 50. Remco brings us this next water pump for RVs, which is less affordable than the previous two water pumps for RV owners. More money is a sign of a better, more professional pump, but is it worth the money? This is a longer, larger water pump for RVs overall. It’s not as versatile as other water pumps, but you should still be able to install in in an ideal place for your RV’s water supply. This water pump’s five-chamber design significantly displaces more water at a time than water pumps with fewer chambers. This is a rather powerful pump that allows water to flow at 85 PSI and 5.3 GPM. This water pump for RVs is quiet due to the smooth flow rate and hydraulic energy transmission, making this a stable, professionally-built pump. A great feature that comes with this pump is low voltage protection. This is meant to keep the water pump safe from subpar power conditions from a weakened or faulty battery. There is a soft-start feature that does away with any rapid cycling. You will be certain that this pump starts up safely without unexpected restarting with demanding cycling power. This may not be worth the money for some RV owners. You can buy two or three of the other kinds of water pumps in this review for how much this one costs. What you essentially get is a more effective, more ferocious pump, which might be too much for your RV to handle, depending on its size. There is no way to get a slower flow from this pump, unfortunately. ​Has a too fast rate of flow. This last water pump for RVs comes to us by Arterra. It has a nice royal blue color with a classic diaphragm design. Arterra’s water pumps offers a four-chamber design for constant and efficient flow of water from your reservoir to out your faucets. This water pump for RVs claims to be the “lowest amp draw in its class”. However, the amount of amps that it draws is not specified. It can self-prime with up to six feet of suction lift. You will need to be careful with how you design your pipework, as if you have a vertical pipe that is flowing upwards and is too long, water might be stuck. This is a nice and quiet water pump that runs very smoothly without any vibrating or buzzing. The built-in bypass helps it purpress any and all noise that it generates. You can still have nice conversation throughout your RV without being annoyed by the water pump. This is another water pump where it can run dry safely without it wearing out. If you run out of water, it will continue to run as normal until you turn it off. You might have insufficient GPM and PSI with this water pump. If you have water you need to heat, this may not be enough to achieve warm water through a water heater. The warranty is not known as of this writing. All we know about it thus far is that it is for parts and part replacement, but the duration of the warranty is to be determined. ​PSI sometimes drops less than 50. To determine the specifications of your RV’s water supply, refer to your RV’s manual. If your RV doesn’t have a manual, or you lost it, you can look for an online manual on the internet for your RV’s water specifications, or you can contact your RV’s customer support for information about its water supply. Can Your Electrical Wiring Handle It? So long as your water pump has sufficient wiring, and your circuitry is laid out safely and wisely, you should not encounter any electrical hazard when handling your water pump’s circuitry around water. Be sure to refer to your water pump’s recommendations and requirements for installation in the product’s manual, as well as determine what wire size is recommended for installing your water pump. How many gallons of water per minute is optimal for your RV? Water pumps for RVs need to reach a certain amount of gallons of water a minute. Gallons of water per minute, or GPM, is how much water your supply will give you when showering, using the sink, flushing your toilet and more. Ideally, you need a water pump that can product around 3.5 GPM for normal-sized RVs and trailers. For larger trailers, you should get a water pump that can product more than five GPM. There are two ways in which you can legally obtain water from your RV: Buy your own water, or use public city water. Buying your own water may sound more sanitary, but you are sure to have to buy more water sooner or later. You can use this water anywhere you go. With public city water, you can get a hose to connect the RV to a water hook-up, and you will indefinitely receive water, which bypasses the tank completely. The downside to using public water this way is that you will only have water when there is an available hook-up. So if you travel, you should rather buy your own water use a water tank. There are ways that you can fill your RV’s water tank of potable water every time you need it. If you know of any dump stations around your area, odds are, there are also water stations to allow you to get additional water for your tank. If you do not know of any dump stations where you travel, you can look online at databases of local dump stations. How Does Your RV Water Pump Get Power? You cannot use an RV water pump without electricity, after all. Because these water pumps are 12-volt, they will run on battery power from your RV. Water pumps should not be too demanding in terms of power, and they can also run by using shore power, or a different, outside source of power. What PSI water pressure is recommended for your camper? The recommended water pressure for RVs is around 60 PSI. For older RVs, it is a little bit less; at 50 PSI. RVs are designed for larger water pressures, up to 100 PSI, but just remember that with more PSI, you are using up more water. 50 to 60 PSI is considered a good balance of water flow and conservation. 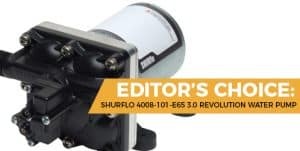 The best water pump for RVs is none other than the SHURFLO 4008-101-E65 3.0 Revolution Water Pump. Shurflo’s water pump for RVs may not look like much, but we were surprised how top notch it performs. Thermal overload protection, self-priming and a built-in check in valve make this water pump a real value. It is a small and affordable pump that doesn’t take up much room; ideal for installation anywhere you see fit.